For red pepper sauce: Place a steamer insert in a large skillet or 4-quart Dutch oven with a tight-fitting lid. Add water to the saucepan to just below the steamer insert. Bring water in saucepan to boiling. Place pepper quarters in the steamer insert. Cover and steam over medium heat about 18 minutes or until peppers are tender, adding more water as needed to maintain steam. Transfer pepper halves to a blender or food processor. Add olive oil, salt, and hot pepper sauce. Cover and blend or process until smooth. Set aside. Sprinkle Cajun seasoning onto chicken. Place chicken in the steamer insert, overlapping thinner portions as needed. Cover and steam for 15 to 20 minutes or until chicken is tender and no longer pink (170 degrees F), adding more water as needed to maintain steam. Meanwhile, in a large saucepan, cook linguine according to package directions, adding green beans for the last 8 minutes of cooking. Drain and return to saucepan. Cut cooked chicken into bite-size pieces. 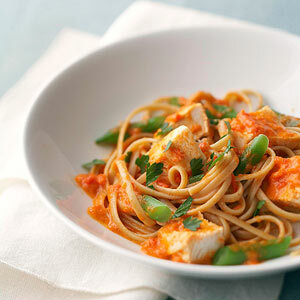 Add chicken and red pepper sauce to linguine mixture. Toss to coat. Sprinkle with parsley to serve. Makes 5 (1 1/4-cup) servings.